As an iconic member of the pop movement of the 1960's, Warhol gained fame and recognition for his depiction of recognizable objects and individuals, from brand names products to faces of the rich, famous, and powerful. 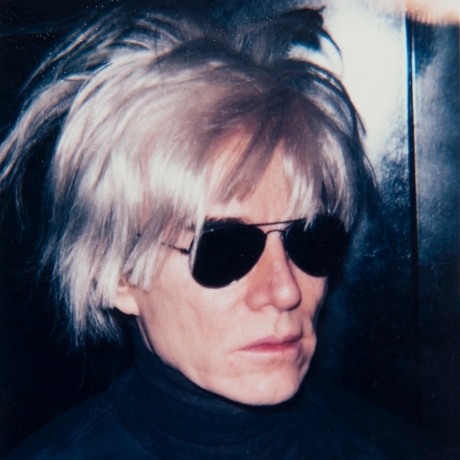 "Big Shots: Andy Warhol Polaroids of Celebrities" provides a look at a lesser-known but seminal body of work by the artist who was dazzled by celebrity and found much of his inspiration in the photographic image. Comprised of over thirty Polaroids of subjects ranging from Debbie Harry to Yves St. Laurent and Giorgio Armani to Yoko Ono, the pictures were taken between 1970 and 1986 on Warhol's favorite camera - the Polaroid Big Shot. Created by Polaroid for practical purposes like the quick creation of I.D. cards and passport pictures, the camera's fixed focal length and point-and-shoot mechanism were perfect for the snapshot-loving artist. The camera also served as an indispensable tool for Warhol in the production of commissioned portraits. He would take several packs of film at each sitting, and then select his favorite image to be silkscreened onto canvas by his assistants. The resulting image became the ground and basis of each painting. Proving that the simplest tools are no impediment to creativity, Warhol's Polaroids are both a celebration of fame and an intriguing look at the cleverness behind the façade Warhol so often used to disguise the intelligence and innovation of his work. Within the tight rectangle that the camera dictated, and behind an implement that provided a necessary barrier between himself and his sitter, we see Warhol finding numerous ways to create memorable, varied, and iconic compositions. They may be small in size, but Warhol's Polaroids serve as vivid portraits and artful time capsules of an era. In recent years, Warhol's Polaroids have gained attention and respect in exhibitions and books, both for their centrality to his portrait practice and as works in their own right. While Warhol is not best known as a photographer, he loved the medium, an apt one for the artist due to its repetitive, mechanical nature and its ability to illuminate the sense of star-power Warhol felt when faced with his famous subjects.